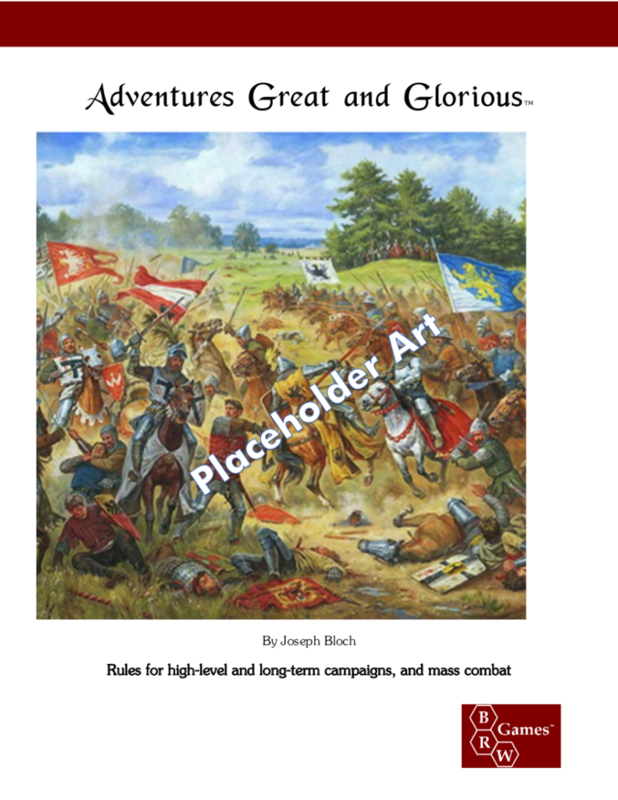 Long-time readers of this blog will recall that I first broached the possibility of a new game book, Adventures Great and Glorious, way back 7 years ago. Over the intervening years, I’ve been puttering, tinkering, and full-blown restarting the project, but not really making any headway. I am pleased to report that the headway is now being made, and I’ve gotten enough written to be more definitive when it comes to a time-frame. Consider this an as-official-as-it-can-be-without-really-being-official product announcement for an upcoming Adventures Great and Glorious book. The Kickstarter, for editing and art, will be coming in Q1 of 2019. Woot! Sharp-eyed readers will notice that what I had been referring to as the “faction game” doesn’t appear there. That’s by design. I finally figured out that was what was holding me back, on a conceptual level. By removing that stumbling block, everything is flowing out almost faster than I can type. Ultimately I haven’t given up on the faction game, but it might lend itself better to a stand-alone card or board game. I’m not worrying about it right now, I’m just rejoicing in the fact that its absence is allowing everything else to come together. A few notes for the curious. “Frontier Lords” is pretty much the old AD&D PH/DMG rules on building strongholds on steroids, with actual governance being more than a chance of revolt based on how many silver pieces per month you tax your subjects. “The Long Game” is inspired by Pendragon. There are campaign phases during the winter, and marriages and kids, and ultimately you can have your children and grandchildren as characters in the campaign after your main character retires. There are two separate sets of rules for mass combat, one sortakinda like the War Machine from the Rules Cyclopedia (but with most of the math already done for you! ), as well as a full-blown set of miniatures rules (also usable with cardboard counters) that plugs into and in many ways mirrors it. There’s also a full-blown set of naval combat rules, also usable either with miniatures or cardboard. That’s actually been done a while now. Meta-magic is nothing like the meta-magic in 3.5. It’s not just buff modifiers to casting spells; it’s a whole change to the way most people understand how magic works. And of course everything will be compatible with most other OSR games out there. My Patreon patrons will be getting some advance peeks and stuff to playtest. If you’d like to get in on the action, do visit my Patreon page. This won’t be the only thing I work on over the next five months, obviously. There’s still plenty of Greyhawk Baklunish goodness that needs writing, and a few other surprises that might be in the pipeline. But I’m so excited at finally breaking the creative logjam on this one, after so many years of it being on a simmer, that I wanted to get something out there. You realize, of course, that now I am going to give you money, yes? This looks awesome. If I ever get a campaign high enough level for this to actually work, I will definitely be breaking out these rules. It really does make me want to DM the campaign that I’ve got brewing in my head now. Oh for free time . . .